Bloons and More Bloons, wonderfully addictive and beautifully conceived little games from NinjaKiwi studios, have been two of the casual gaming community's biggest recent hits. 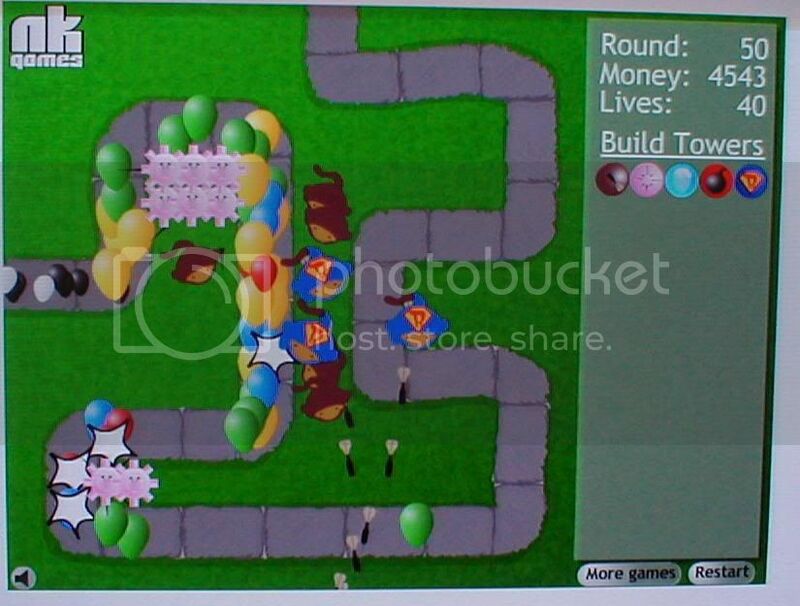 Now, in a decidedly different vein, comes Bloons Tower Defense. Bloons Tower Defense takes the Bloons concept—popping balloons, preferably with monkeys involved—and spins it in a new and intriguing direction. Players start with an aerial view of a winding path. At the start of each level, a stream of balloons enters from one side and, unless popped, will escape out the other end. Balloons come in red, blue, green, yellow and black flavors; blues move faster than reds, greens faster than blues, and so on. Also, increasing the complexity of the challenge, higher "ranking" balloons contain lower ranking ones inside them. So, blue balloons, when popped, reveal reds, greens contain blues which contain reds, and so on. 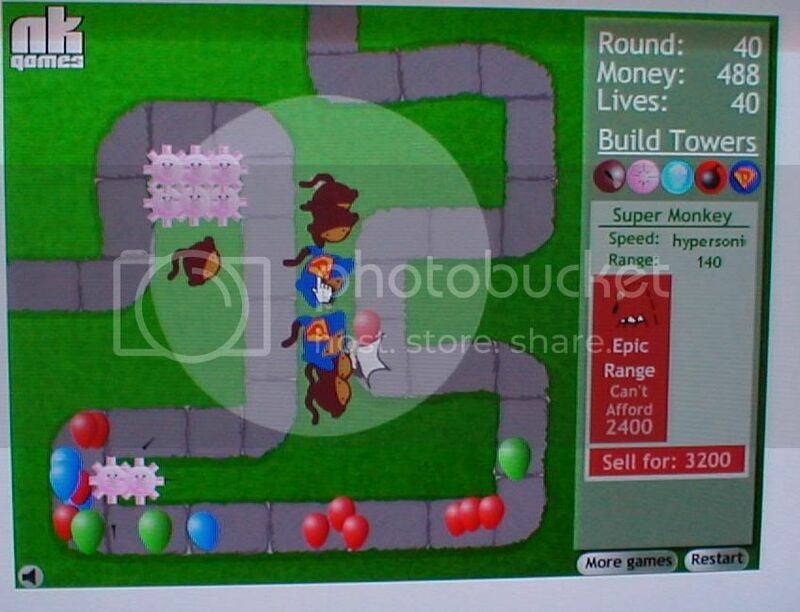 And what can one player do against such a mighty horde of bloons? Build towers, of course! And by "towers," I mean bombs, dart-shooting monkeys, tacks, and so on. Each type of tower has two possible upgrades, such as increased shooting radius, piercing darts, bigger bombs, etc. Each category also has significant strengths and weaknesses; one of the joys of the game is discovering the perfect combination to maximize popping potential and beat the seemingly endless flood of bloons. 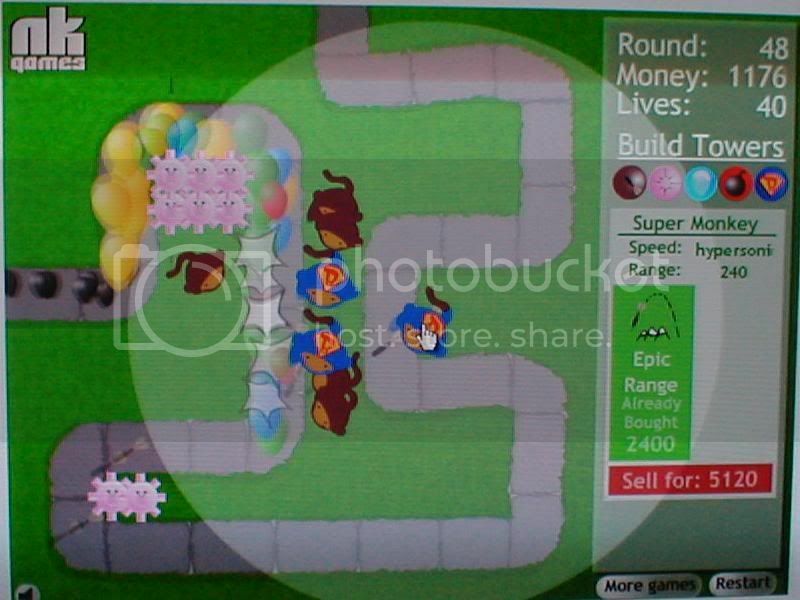 Analysis: I was rather disappointed with Bloons Tower Defense. Not because it's a bad game; quite the opposite, in fact. It just, well, feels unfinished. 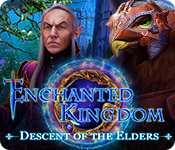 With a little bit more work and time, the designers could have turned a fun game into a truly exceptional offering. Chief among my complaints is the lack of a save function (playing 37 levels over again becomes very, very tedious), and the absence of music. The "restart" button literally means just that; a button that could replay the previous level would make more sense and save a lot of time. 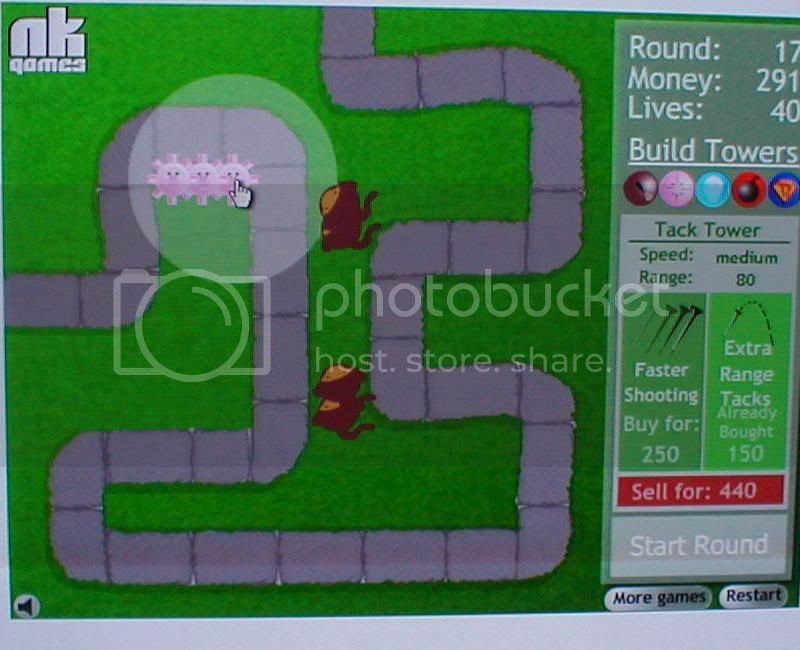 As much fun as I found Bloons Tower Defense, ultimately the tedium overcame the enjoyment. A flawed but engaging title, an amazing amount of potential fun wrapped in a frustrating presentation. And yet still likely to please die-hard Bloons fans. 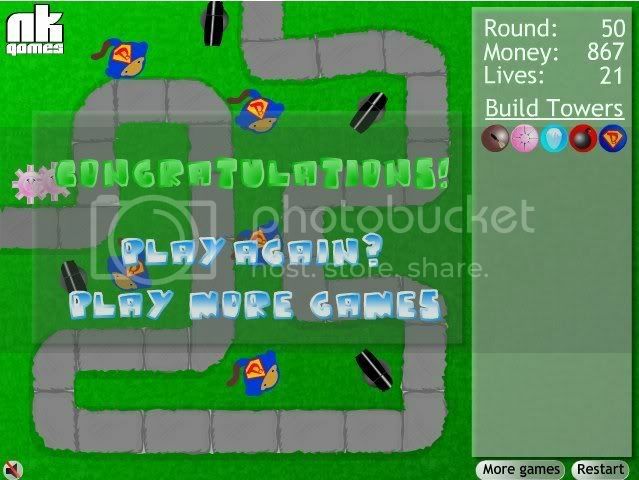 Also check out NinjaKiwi's first two in the Bloons series, Bloons and More Bloons. 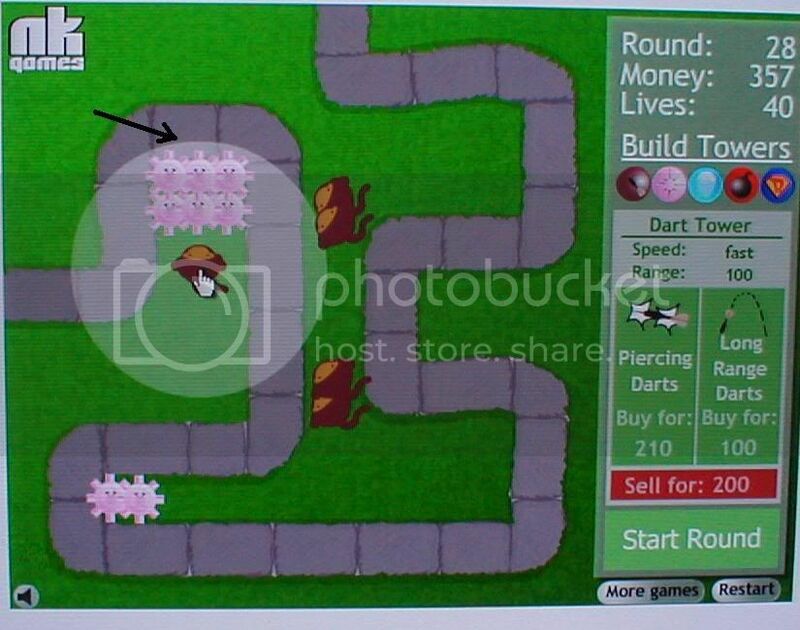 Bloons Tower Defense Walkthrough now available! I'm such a sucker for a good TD game and while this one isn't terribly difficult it is a lot of fun. Always upgrade the towers as soon as you can afford to. This game doesn't have an interest factor like many TD games do so it doesn't matter when you spend your cash. a fifth pincushion goes just to the left of that one - now this is tricky because it'll just BARELY fit in there but if you find just the right pixel space you can do it. I put two in there right next to each other - no need to upgrade the distance of the first one. You'll place it so tight against the path that it already covers the entire loop there. Time for a monkey to help out toward the beginning. As soon as you're able to afford it buy a super monkey. Stick him just above the two lower monkeys in the middle of the screen. Do NOT upgrade that one. I'll explain why a little later. Trust me on this. Ain't that a joy to watch? That little bugger sure can deliver can't he? Let it roll for a while and save your cash for a while again. Buy a second super monkey when you can and place this one just below the two top monkeys in the middle of the screen. Put him as far left as you can because when you upgrade this one to epic range he'll be reaching waaaaay past the right side of the screen. 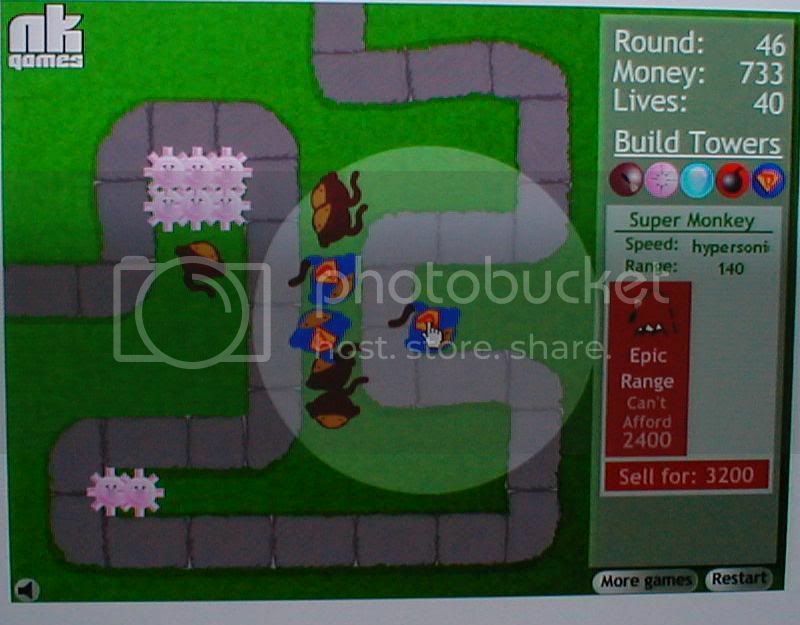 Place a third super monkey in the middle loop on the right side of the screen. Of course go as far to the left as you can. In this picture he dropped a little somehow and didn't quite get exactly where I wanted him but with these rapid fire guys does it really matter? If you want you can put another pincushion in the hairpin corner at the bottom left of the screen but you won't really need it. Just sit back and wait for this screen to come up. The monkeys have kind of a blind spot that is mentioned in the message after one of the levels. This is why you don't want to upgrade that lower super monkey. When the bloons are traveling along the bottom path the monkeys can't seem to find ‘em. The super monkeys end up shooting a stream of darts off into middlespace. 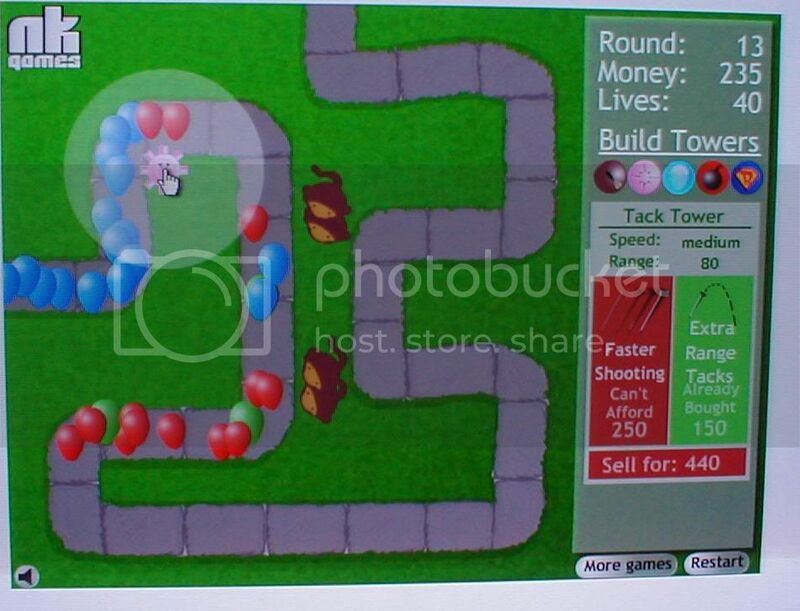 Like the bloons idea!!! Neat! Heh. I was just about to recommend this game. I found this game a lot easier than most other tower defense games, but still challenging. The SuperMonkey is great, but not if you put him in the wrong position. most of the towers, especially the tack and ice towers are useless. 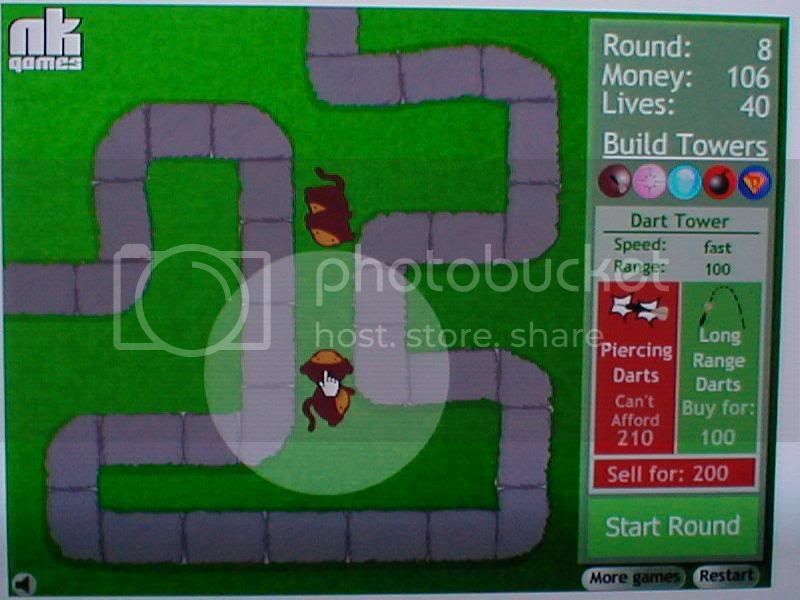 Start out by making a dart monkey right on the outside edge of the final turn before the end of the level. This monkey will get a shot at both ends of the trip. Build up a "Kill Zone" of dart monkeys heading down from there, upgrading to pierce shot when possible, range bonus when needed. When you've made a nice, long path down, start filling in the area under the start point with more dart monkeys, upgraded similarly. Expand into the lower-left loop when you feel it's needed using dart monkeys upgraded as you deem is needed. Using this, I lost only one life, and that was due to making too many monkeys too soon and not upgrading the ones i had enough. I wonder how familliar Jess is with Tower Defence games. A save function is rare to see in a tower defense game, in fact, I can't even recall seeing it once. Aside from that, it's an endurance game. You set on one tactic, and see how far you can get, then change tactics, and try again, or not, if you're frustrated. Also, come on, how can a button labeled restart, that actually restarts the game cause a complaint? That's like saying "The rewind button on my dvd player makes the movie rewind in high speed! I just want it to do one frame!" The absence of music, in my book, is a good thing, it would be extremely hard to find a piece of music that doesn't start grating nerves after the tenth loop, and seeing as the higher levels last longer, I imagine that will happen relatively quickly. As for the review itself, you don't build tacks or bombs, you build tack shooting towers, and bomb lobbing towers. Also, not every tower has two upgrades, the supermonkey only has one. To me, it's a very valid entry in the tower defence genre of casual games. It could use a bit more depth perhaps, but then again, there's only so much one can do with only balloons as creeps. Perhaps a bigger variety of towers, or a more extensive upgrade system? 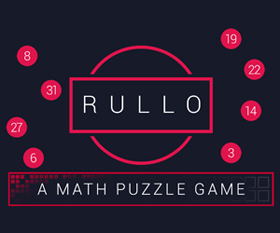 Oh dear, this is such an easy game, I can't really recommend it as long-term fun. After 50 lvls you win the game and may start it again. Come on, I've beaten it at the second attempt. 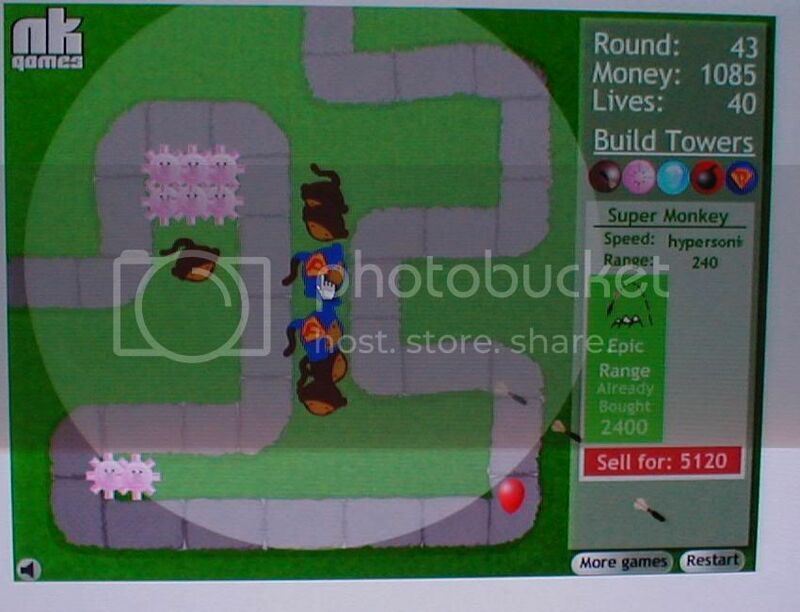 The other turrets do not have a real added value to the game, as you may easily win playing with 15 monkey turrets and 4 super monkeys. 2 of the super monkeys not even maxed out and still 20 lives left. Jess is right about having the feeling of an unfinished game. Please, Bloons-Maker, sit again at your table and come out with a second edition... Looking forward. First built the 2 normal dart monkeys, upgraded both fully. Then 2 tack towers in the left upper corner, fully upgraded. Then the three at the bottom, 1st with only speed, second with both, third only speed upgrades. Then added two more tack towers in the left upper corner, though you could place them in the right middle as well, I suppose. After that, just save up for the super monkey, keep saving while adding a tack tower every now and then. It should be do-able with less, since the last 4 levels never even made it to the right 4 tack towers. Beat it on third attempt with 31 lives left, and lost all those in the early levels. so a bit too easy, but a nice game. My methods was a bunch of dart towers in the top middle, and some tack towers on the inside corners. Then super monkeys in the middle. I didn't find the bomb or freeze much use. 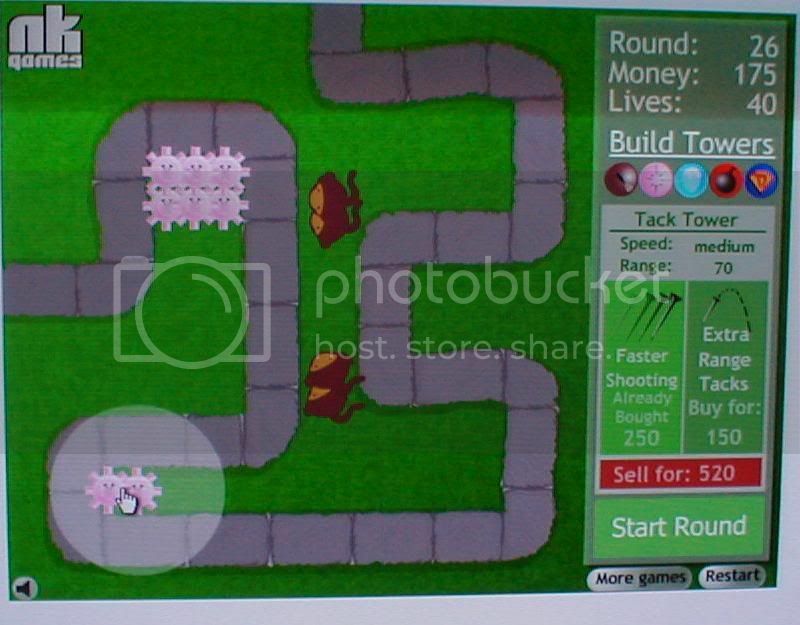 i think tack towers work best near the beginning of it to thin things out a bit and also they are really useful with the black and white bloons. I certainly do respect what you say, but I don't think that it's all necessarily valid. Just because most tower defense games don't have a save function doesn't mean that it wouldn't have been welcome or useful in this one. One misjudgement can literally take all your lives, and if it's on the 38th level is can be pretty offputting to go all the way back through. When I first saw the "Restart" button, I assumed that it meant restarting the current level while it was in progress. It may have been my inexperience, but I thought it wasn't clear. I can appreciate the potential annoyance of a looping soundtrack, but the option would have been nice. Maybe I wasn't clear, but I thought that it wasn't necessary to keep repeating "towers" in each sentence, given that I mentioned several times in the first few sentences that the player, well, built different types of towers. Perhaps I should have thought differently? 1) There's no interest, so you don't have to worry about whether or not that $25 tower in level 5 is going to prevent you from buying that $5000 tower in level 38. 2) You don't have to worry about enemies with thousands of hit points, and whether or not your towers can dish out that much damage. Yellow ballon? Four darts. Easy. 3) Combine that with the whimsical concept of dart-flinging monkeys (and overcaffeinated monkeys in mexican wrestler's masks), and the game's just too silly not to enjoy. It's certainly not a game to be analyzed and optimized like some of the others, but that's not always the point. As for the strategy itself, stronger enemies are generally faster. If you can pop all the fast balloons early, you're effectively buying more time for the monkeys to finish them off. So, I put tack towers (upgraded for speed, not for distance) at the insides of the first few corners. Rarely did a yellow balloon make it to the halfway point. Exactly! I really enjoyed this game too, for all the same reasons you covered. Sometimes it's nice to have a simple game. Sure, it takes less time, but the time spent is more enjoyable. I find that making a misjudgement costing all your lives at the high end of the game (It only is 50 levels, after all) is a reasonable concequence. I'll agree with you that it can be annoying to start all over, but it does give you a chance to put in practice what you learned from the first, second, third time around. 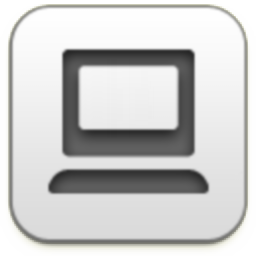 the restart button... Well, I suppose one could mistake it for a undo function at that. I don't know about it bieng inexperience... Restart just means to start again, to me anyway, not "to start again halfway in the game". "And by "towers," I mean bombs, dart-shooting monkeys, tacks, and so on." you strongly imply that the player doesn't actually build towers by putting it between the " " marks, and then naming the tower weapons. whereas, aside from the dart monkey, and super monkey, towers are exactly what you build. You might mean something else with "towers" but the game still just has you build towers, none the less. Anyway, this isn't a bickering thread, I just wanted to express, and with this, explain, my position. Cheers for a nice game, and a job well done, regadless my (minor) complaints about the review. :) As we say over here... "The best sailers are on the dock." It's always easy to have critique when you're not doing the job yourself. 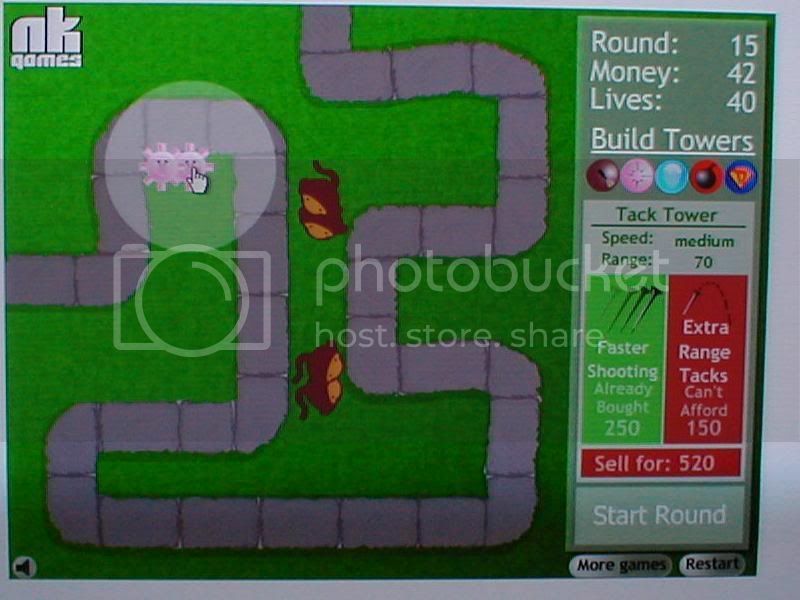 It's not a poor tower defense but I think it's too generic. The previous games like Desktop TD and Onslaught 2 added something new to the genre while this one doesn't standout from the rest. Another complaint I have is that the game is too easy for us experienced with these types of games. For me, what makes these games fun is trial and error. Going through the game several times to figure out the best strategy. I beat this game the first time I played it. I would have liked to see different difficulty levels. after it taking so many tries i was really hoping for a better finish than just "congratulations..."
I see some saying there is no interest. I seem to see 10% added at the end of a round. You don't have to upgrade every tower. I used 9 monkeys 7 tack towers and one bomb tower. Placed them in the right spots till I could afford the supey monkeys. I ended up with 4. I didn't get a perfect game but I had 30 lived left. It's not a great tower game but was fun. @nic2800: You do get a little extra money at the end of each round (first 100, then 98, 96, etc.). I suspect that's what you're seeing. i played it and the 1st time i played it i got it all. This game had great potential... but seriously fell short of the mark. As the reviewer said - too easy, too rushed and ultimately forgotten in about 2 minutes flat. An inspired idea that suffers from uninspired execution. Won without a supermonkey and lost zero life! yeah, i lost 24 lives after like 15 levels, and didn't lose another the rest of the game. I don't understand how people can end up with 4 supermonkeys. I beat the game with TONS of cannons, normal monkeys and tack towers. All were upgraded with speed (tacktowers), double pirecing (monkeys) & big bombs (cannons). I'm not sure if you're asking a question or making a statement there Winona So... but if it's a question just look at my walkthrough. 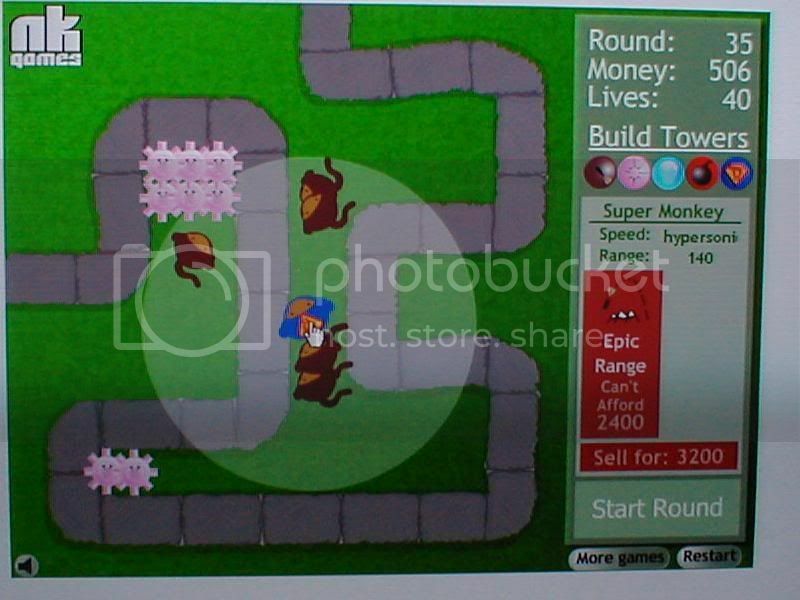 I could sell some of the monkeys and tack towers in the last level or two and end up with five super monkeys. That's a bit of overkill but it is fun seeing the bloons not even make it to the south end of the board. To me the bomb cannons are a waste of time and money. Naturally the same goes for Ice towers. I'd be interested to follow a strategy from someone who makes them worthwhile in their system. For me the tack tower faster shooting is worth 300 not 250 so what do I do? Great game and thanks for the walk through. I can't wait for the 2nd generation of this game!!! You can beat it with 65 monkeys only. I agree there should be more levels to this game, and it should get tougher faster once you get into the 40's levels. Fun game but it gets old too fast when it's this easy. 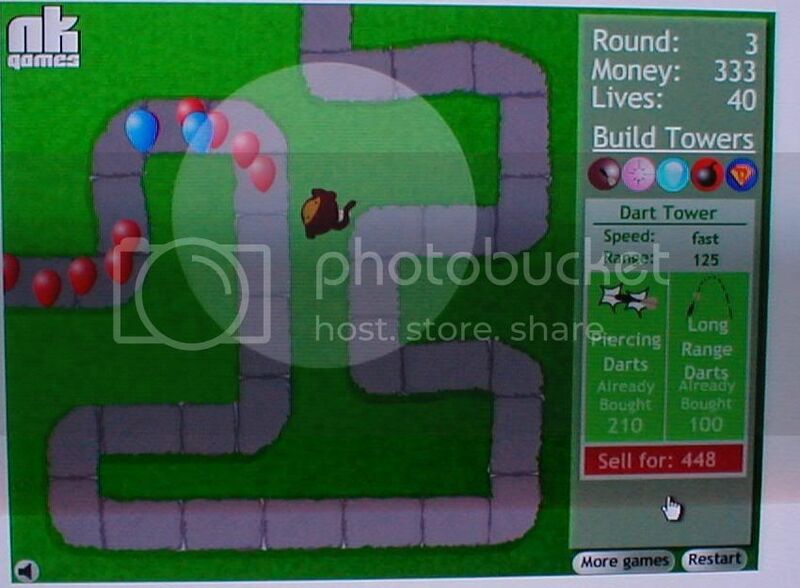 Haha i just beat Bloons tower defense using only the monkeys that shoot one dart! i counted at the end and i had 37 monkeys worth a total of $31,000 i just kept buying and upgrading untill i could kill anything. woot! forget about the cannons, and tacks and freezes and all of that... you can even forget about the super monkey. If you just arsenal yourself with darts, the hardest part about not losing any lives is just to position the first couple wisely (pack them into the large space so that they can hit balloons at the beginning and end of the map). I beat it with all 40 left using only regular monkeys. Depending on which version you play, tack towers can be either 525 or 400 each! And the truth of the matter is no matter which one you play, you never need a super monkey to beat the game with 40 lives. Putting a load of dart towers around the first few corners, and a couple of monkeys with piercing darts in the central column will do the trick (the only difficult part is putting them down in the right order). 10 tack towers >> 1 super monkey, so it just isn't worth it at 400 a tower. Very interesting game, Personaly i spent hour's makeing the perfect defense,which is kinda difficult. 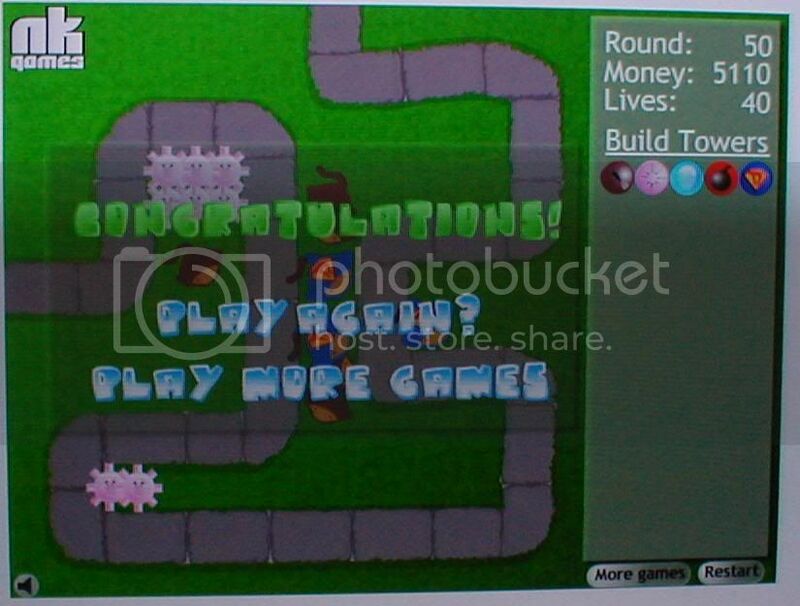 First time, I beat it ALL dart towers no lives lost, perfect game. I literally had like 200 dart towers. It's so easy now, also a good strategy is use all dart towers until round 35, then start saving up for super monkey, and he'll just do it all if you also buy his epic range. 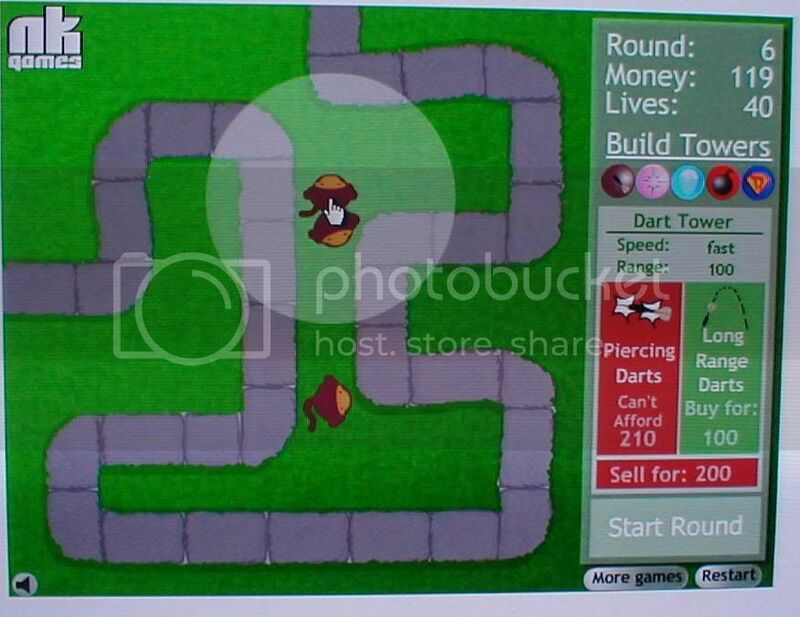 Just so everyone knows, it is TOTALLY possible to win this game with only "dart towers" - monkeys!! i have done it many times. I've finished without losing a single life with monkey's who shoot "piercing darts" and i've finished with about 20 lives left using monkeys with no upgrades at all!!! AND, i still make enough $$ to buy two or three super monkeys towards the end if i want to, though it isn't necessary to finish the game. 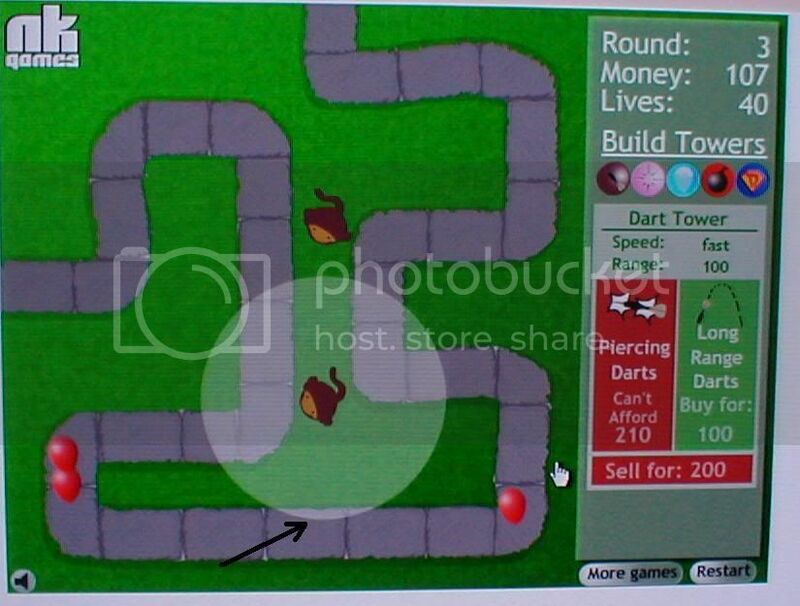 I have found it very easy to win Bloons Tower Defense using only Dart Towers (monkeys). In fact, I just recently played it using only Dart Towers and only giving them the piercing dart upgrade (forget about range, you don't need it). Put the first monkey in the top center so it can hit the first bend, the 3/4 bend, and that last bend to pick up any stragglers. 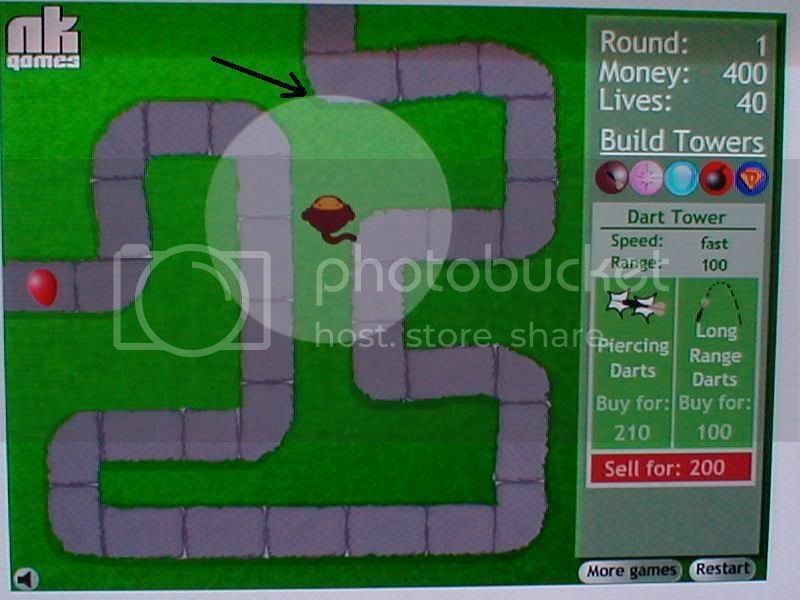 Buy at intervals of 460 money (when you can buy a new dart tower and give it the piercing darts upgrade). Put your second monkey in the big loop at the beginning that looks like an upside down U. At your next 460 money, put your third monkey at the top right to catch the bend of track that your first monkey couldn't reach. 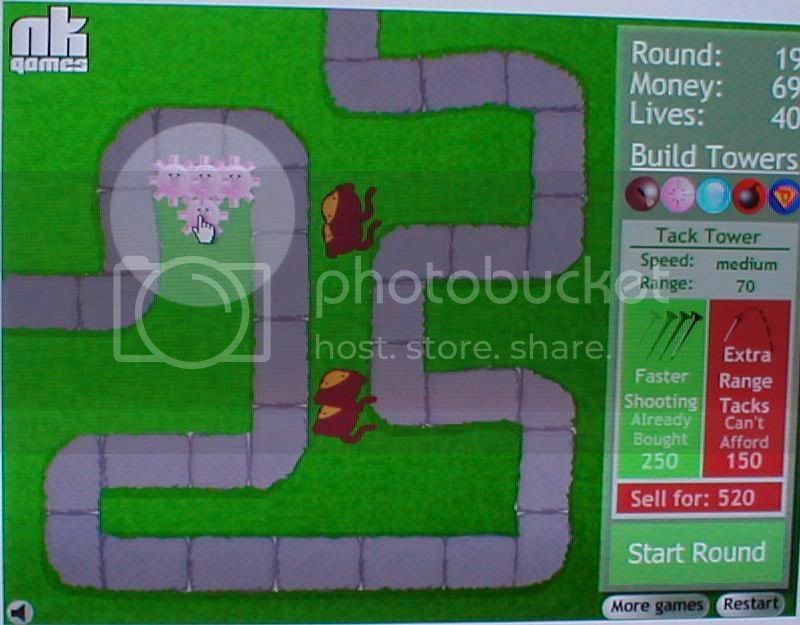 Your next monkey goes at the bottom of the screen (the right side is better than the left because it is a bigger stretch of track, so your monkey has more time to blast bloons. After that, you can pretty much put your monkeys wherever. Rack up money, and at every 460, put a monkey with piercing darts anywhere you feel like you need it. 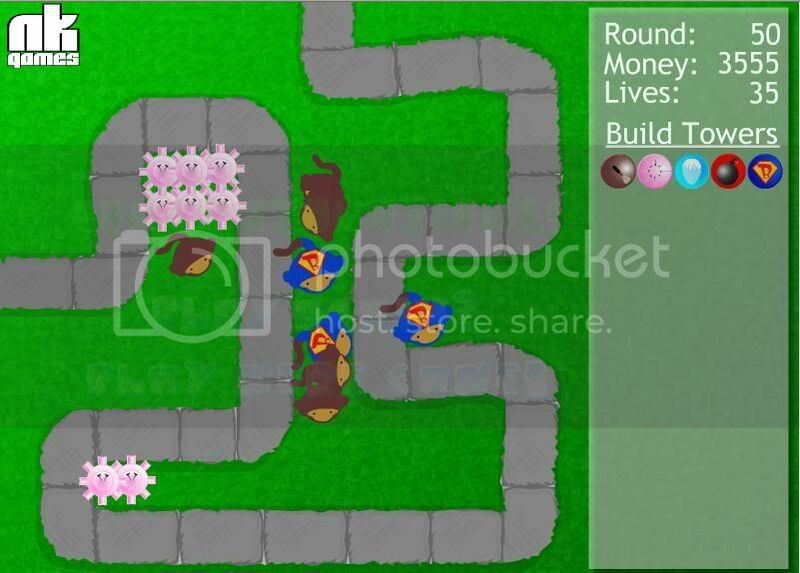 I like to put a couple of monkeys behind that very first bend in the track... not a strategically advantageous location, but once you get into the black bloons and white bloons, it helps to have a couple monkeys there to knock them down to a smaller side. I don't need any kind of tower in the game. 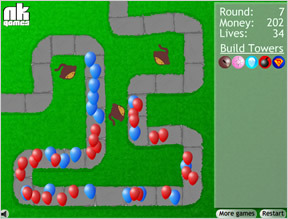 By level 30 or so, the bloons don't even make it halfway across the track. The super monkeys, while super cool, are nothing compared to 50 plain monkeys with piercing darts. I found this to be very easy after a few tries. I have finished the entire game without losing a life, with only 30 dart towers. No tacks, no super monkeys no nothing. focus them at the beginning and on the corners. I found that groups of 4 worked well. 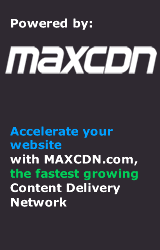 Does anyone know if a second version is coming out? You know that hint that more or less says, "It is a far, far better thing to upgrade your towers than to keep buying more"? Baloney. I bought all monkeys, no upgrades, and only lost one life. To be fair, I probably wouldn't even have lost that life, but somewhere between levels 30-42, I was just hitting "Start Round" and zoning out. MUCH overkill, but I ended the game with 85 monkeys (filled the screen... it was awesome), and 9559 money. *Unable to add/upgrade towers in the middle of a round. *You choose if the monkey aims at the front of the line, the end of the line, or the highest ranked balloons in range. *Uber-dart: only pierces one balloon, but destroys all ranks (ie. yellow balloon disappears with full score rather than being downgraded to green, then blue, then red). Clearly, this upgrade would have to be ridiculously expensive or else the game would get REALLY boring. *Aussie monkey... let's use that boomerang bloon! (Crap for short-range, but killer at long-range. Its area of effectiveness would look more like a doughnut than a circle. *Every 10 levels or so, the track changes. All monkeys in the way of the new track are instantly refunded (at that fun 80% rate). As is, this game feels greatly unfinished. I'm all for an updated version. I won that one without losing a single life and using dart towers only, no upgrades. I didn't need about 1/4 of the monkeys, the ones on the far right are all facing up because they didn't do anything all game! This game is very simple and if another version comes out, it needs to be much harder (or at least have the ability to up the difficulty). Has anyone managed to beat this with only tack towers? I got to level 41 using only 1 dart tower and the rest tack towers. It is probably possible to do better than this. 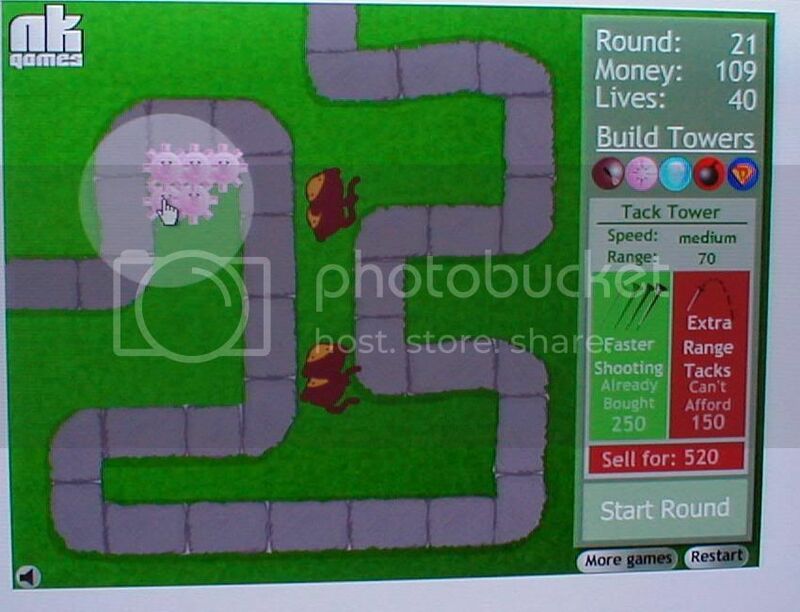 To answer my own question, there is a version of the game in which tack towers cost $325 instead of $400. I beat this version using tack towers and 1 dart tower for the first half. I had 31 lives left. Me and my sister beat level 1 through 49 with monkeys (dart towers and hypermonkies). 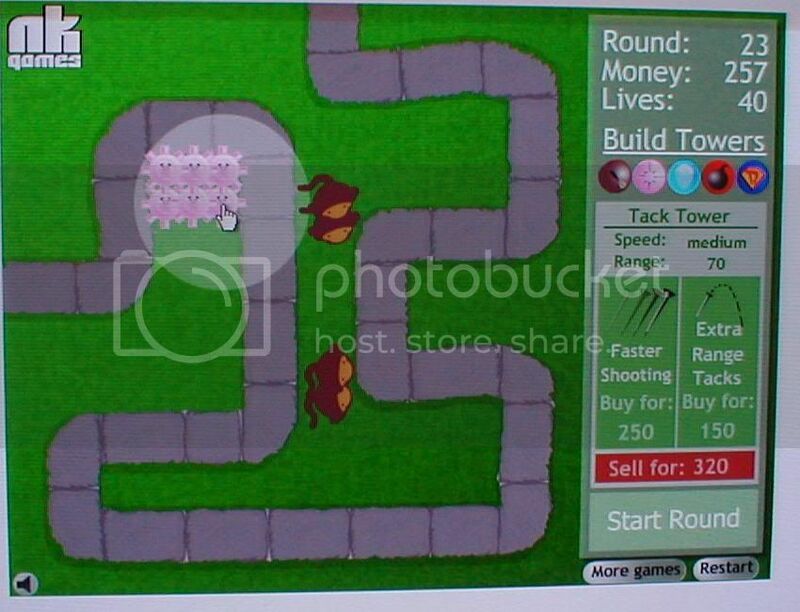 then we sold everything, bought tack towers, and won! You're 'Faster Shooting' upgrade for pin cushions is cheaper in your game.. It costs 300 for me and 250 for you..
Ok, you are awesome! Thanks sooo much. I beat the game the first time with your help, and had 39 lives in the end! AWESOME!!!! I just had to come here to say that I began level 47 with only 1 life left and somehow managed to beat levels 47, 48, 49 AND 50 with only 1 life. I'm usually never good at Tower Defense games. I figured out a sure fire way to win. place iceballs on either side of a path (directly across from eachother. that way, th bloon just freezes over and over again giving you enough time to pop those trouble ones! man since i followed the guide i only lost 5lives hid 3supermonkeys 8pin thingys and 5normal monkeys everything was maxed out. Followed the walkthrough yet lost 3 lives. I'm stuck on level 23! PLEASE HELP I CAN"T DO IT! Walkthrough is problematic. You lose lives sometimes, randomly. Please update it with a more secure one. You probably won't believe this, but i finished it with only the monkeys!i used 44 !!!! awesome. and omg, i have 10778 money to spare. and i had four super monkeys! Great game! I kept on buying dart towers. At the end I had 99 of them and 1 super monkey. In my opinion, super monkeys aren't that good. Once you get a supermonkey it gets boring. Having trouble getting the badge? The trick is to just build normal monkeys and give them the piercing upgrade, start building them in a row down the centre, then create an upside down T by doing the bottom row after that just keep cramming in more wherever they fit.